Chef David Chang of Momofuku is opening a restaurant/pig farm in Chicago this fall and I can hardly wait. I have to warn you though, the concept is a bit weird. The new restaurant, called Momofuku Pig Pen, is going to be in a 20,000 sq. ft. warehouse in Pilsen where the pigs will be raised and slaughtered on-site. It will also have little Mangalitsa pigs in the middle of the dinning room so you can feed and pet them. Don't worry, hand sanitizer and buckets of raw corn will be on every table. I'd love to be able to eat his bao buns in Chicago, but I'm not sure I want to play with the piggies first. Let's hope the Pig Pen offers some vegetarian options and some of Momofuku's signature desserts as well. I've never been to his Milk Bar in NY, but I've heard of some unique creations by their pastry chef Christina Tosi and have been dying to get my hands on some of her recipes. I think a cookbook is slated to come out next year, but some recipes have cropped up here and there online. Some of her famous desserts are crack pie, blueberry cream cookie, cereal milk soft serve and the compost cookie. I found the recipes online for the crack pie and blueberry cream cookie, but I'm waiting to make a crack pie for a special occasion and the blueberry cream cookie is a bit too much effort. I've been looking for the compost cookie recipe for awhile and although there have been pretty good guesses, there hasn't been an official recipe available until now. Thanks to the Amateur Gourmet for the find. Now for the cookies ... before you start, I have a few suggestions: (1) Use a silpat or get some parchment paper if you can. I didn't have any, so I used aluminum foil and especially if you add chocolate candies with caramel in them, the cookies will run and will stick. I made a lot of cookie donuts this way. (2) An ice cream scooper with a lever, if you have it, will come in very handy because the dough is very soft and sticky. Note: Christina Tosi uses chocolate chips, butterscotch chips, pretzels, coffee grounds, graham crumbs and oats in her cookies. 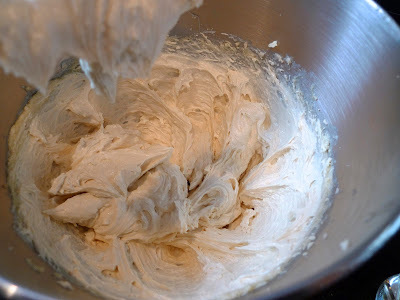 In a stand mixer with the paddle attachment, cream butter, sugars and corn syrup on medium high for 2-3 minutes until fluffy and pale yellow in color. Scrape down the sides of the mixing bowl with a spatula. On a lower speed, add eggs and vanilla to incorporate. Increase mixing speed to medium-high and start a timer for 10 minutes. During this time the sugar granules will fully dissolve, the mixture will become an almost pale white color and your creamed mixture will double in size. When time is up, on a lower speed, add the flour, baking powder, baking soda, and salt. Mix 45-60 sec just until your dough comes together and all remnants of dry ingredients have incorporated. 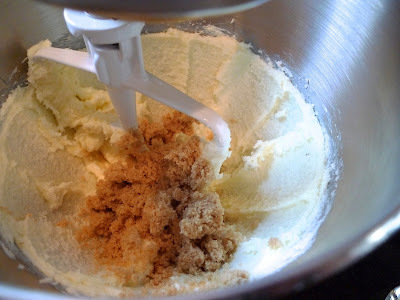 Do not walk away from your mixer during this time or you will risk over mixing the dough. Scrape down the sides of the mixing bowl with a spatula. 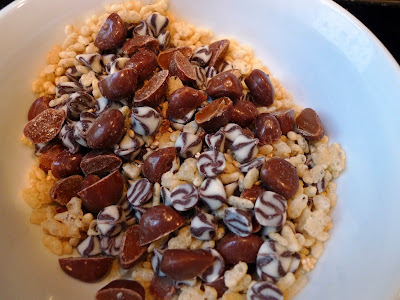 My baking ingredients were milk duds, white and milk chocolate swirled chips, rice crispies. 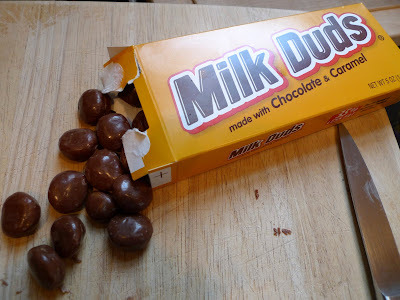 I cut the milk duds in half. I felt a it was a bit of a sugar overload, so I also added some instant steel cut oatmeal from my cupboard for added texture. Here's my hodgepodge of baking ingredients. On same low speed, add in your favorite baking ingredients and mix for 30-45 sec until they evenly mix into the dough. 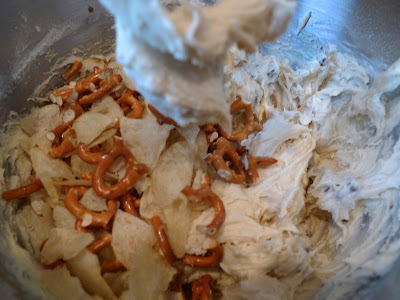 For my favorite snack foods, I added pretzels and potato chips. I just crushed these with my hand. Add in your favorite snack foods last, paddling again on low speed until they are just incorporated. Using a 6oz ice cream scoop, portion cookie dough onto a parchment lined sheet pan. I later realized that these cookies expand and become quite large, so I switched to a smaller ice cream scoop to make smaller cookies, so the choice is up to you (although see my comments below). Wrap scooped cookie dough tightly with plastic wrap and refrigerate for a minimum of 1 hour or up to 1 week. The dough is quite soft so it needs to firm up before baking. 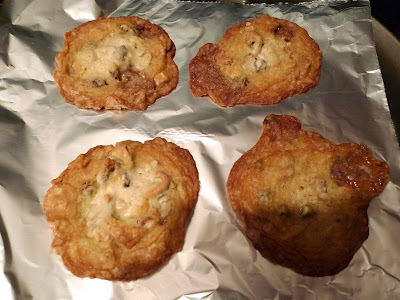 DO NOT BAKE your cookies from room temperature or they will not hold their shape. When the oven reads 400F, arrange your chilled cookie dough balls on a parchment or silpat-lined sheet pan a minimum of 4" apart in any direction. I have a confession to make. I got lazy and instead of chilling the dough in the ball form, I just chilled the dough in a bowl and scooped it out right before baking. As annoying as this process is, because you have to put several cookies sheets into your fridge, it's worth the extra effort because it makes for a puffier and prettier cookie. Bake the cookies for 9-11 minutes. While in the oven, the cookies will puff, crackle and spread. At 9 minutes, the cookies should be browned on the edges and just beginning to brown towards the center. Leave the cookies in the oven for the additional minutes if these colors don't match up and your cookies stills seem pale and doughy on the surface. 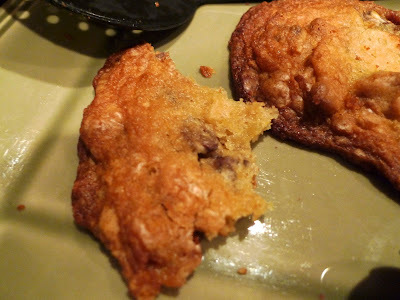 Here are the cookies, but like I said, the milk duds melted and spread and made for not very pretty cookies. 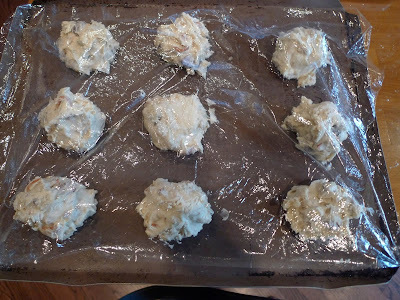 Cool the cookies completely on the sheet pan before transferring to a plate or an airtight container or tin for storage. At room temp, cookies will keep fresh 5 days. In the freezer, cookies will keep fresh 1 month. Here's a picture of the cookie up close. Do you see pieces of pretzel in there? 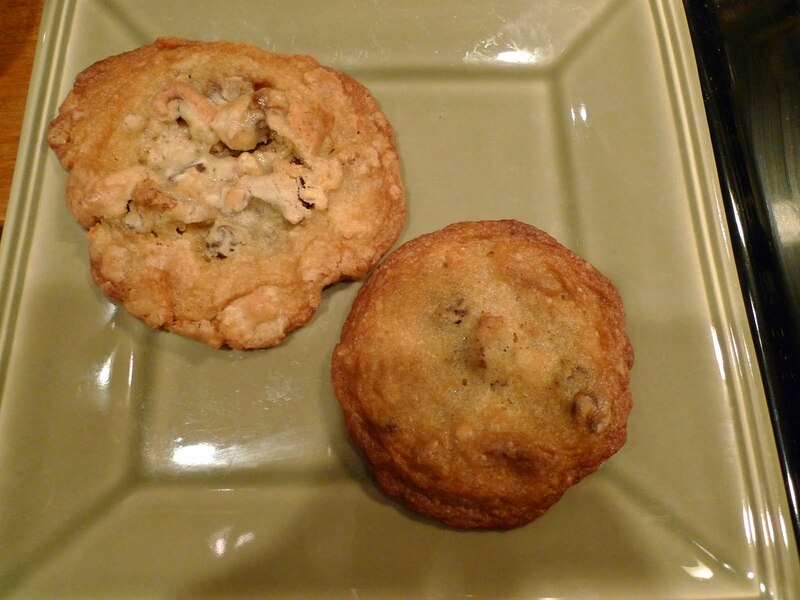 Here's a picture of the original cookie using the large ice cream scoop vs. the smaller one. The texture is more apparent in the larger one and looks yummier. Do you also see how the smaller cookie is flatter, it's because I didn't chill it in its ball shape. I just chilled the dough in a bowl when I made the smaller cookies. Maybe all these little details are why this cookie is so famous, because it takes a lot of care and effort ... and refrigerator space. So what's the verdict you ask? This cookie reminds me a lot of the NY Times cookie in how you have to beat the sugar and butter for a long time, refrigerate the dough and also the added saltiness. I think if you love the whole salty vs. sweet combo, you will love it. I feel like it's a mix of a chocolate chip cookie with chocolate covered pretzels rolled into one. 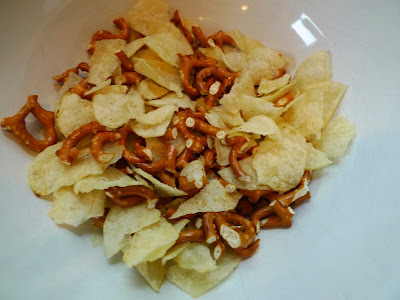 I could barely taste the potato chips, but the crunch and saltiness of the pretzels in this was great. Next time I'd just stick with the pretzels only since you don't even get to taste the chips. Why consume extra calories if you can't even taste it. haha. These cookies are highly addictive. I had one for breakfast today, along with leftover pancakes, and I wasn't hungry at all till way past lunch. Glorious pancake recipe coming up next!!! Yes, try it with the pretzels, the chips you can pass. 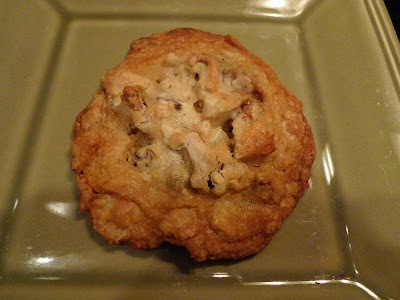 A black & white cookie ... do you have a recipe you want me to try? I've never been a big fan of the black & white cookie but maybe I never had a good one. Haha, OK, I will try them out just for you. I still am behind. I need to try a strawberry shortcake recipe for you too.